Small and reasonably priced, the ZeroTech Dobby is ideal for those who want to sample the delights of drone ownership but are intimidated by the cost and size of some of the leading devices on the market. If its video capabilities and stamina were better, it would come with an almost unreserved recommendation. The world of drones is broadly split into two sectors at the moment: high-end models that cater for professionals who need super-stable aerial shots in 4K resolution, and cheap-and-cheerful pocket-sized quadcopters, which are for entertainment rather than anything too serious. The ZeroTech Dobby aims to occupy a third, middle tier; it's not as expensive as the likes of the DJI Phantom 3, but it offers a surprisingly strong suite of features, and can record 1080p video as well as capture 4K images. It can fly to around 300 meters above sea level, and can be launched from and land in the palm of your hand. Control is handled via an app on your smartphone, and when outdoors the Dobby uses GPS to maintain its position with impressive accuracy. ZeroTech is pitching the Dobby as a 'selfie drone', and to that end it's an eminently portable device. In terms of footprint it takes up about the same amount of space as a typical smartphone, although at 36.8mm at its thickest point it's not going to slip into every pocket easily. Still, it's a damn sight more portable than your typical high-end drone, and can be stored in your bag without weighing you down, making it an ideal traveling companion. The unit is fashioned from a pearl-like white plastic, and has four arms which house the propeller units. These arms can be folded in when the Dobby isn't in use, but the propellers aren't fixed – they swing around even when the arms are docked, so you have to be quite careful when handling the device. On the base of the Dobby you'll find the battery compartment, as well as a sonar sensor and optical flow sensor – these allow the device to be used indoors and also permit safe landings and takeoffs, not just from the ground but from the palm of your hand, too. The battery has a capacity of 970mAh, which is good for around five minutes of flight time; to recharge it, you have to unclip it from the bottom of the Dobby and place it in the bundled charging dock. The battery has a four-stage LED which indicates how much juice is left in the tank. For such a small drone the Dobby is impressively built, and it can withstand a few knocks. The most delicate components are its plastic propellers, which are easily damaged should the unit accidentally brush against a solid object. Helpfully, ZeroTech does offer a pair of plastic clip-on guards which create a protective barrier around the propellers; however these aren't included with the Dobby – you'll have to purchase them separately. The Dobby's base-mounted sensors will prevent it from performing any risky landings, but the unit lacks any other form of impact awareness, which means it will collide with objects such as trees or buildings if you fly too close. 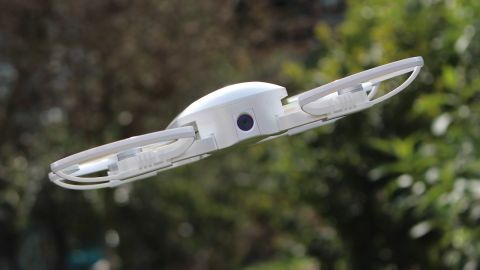 The front of the device houses a 13-megapixel camera which can be manually angled to one of six different settings, allowing you to take impressive bird's-eye views from quite high up. Unlike some high-grade drones, the Dobby doesn't come with its own remote control. Instead, you download an application to your Android or iOS smartphone and control the drone from there, using touchscreen or motion controls. We found the latter option too cumbersome and opted for the touch-based interface instead. There's also an option for voice commands, although we had quite a lot of trouble getting those to work properly, too. The interface is pretty straightforward. There are two virtual sticks on the screen, with the left-hand stick controlling altitude and horizontal orientation, while the right-hand one allows you to move the drone sideways, backwards and forwards. A take-off and landing button is also included, and it's possible to toggle between taking photos and video at the tap of an icon. Several levels of electronic image stabilization (EIS) are included to reduce camera shake when recording footage, with the most extreme setting giving a silky-smooth image, but with one drawback – to keep the video steady the software adjusts the orientation of the image on the fly, and this results in black areas appearing at the edges of the frame. Using the app you can instruct the Dobby to track a subject's face or – at longer distances – follow a particular object or person. You can also command the drone to orbit a particular point, while another mode allows you to perform a smooth, Hollywood-style tracking shot. As these modes are controlled by the drone itself and not the user, they're usually free from the EIS-related problems mentioned previously, as the unit is able to compensate for wind effect and maneuver a lot more smoothly than a human operator. ZeroTech issues regular firmware updates for the drone to improve functionality and add new features. You're prompted whenever a new firmware is available, and the process of downloading it to your phone and then uploading it to the Dobby is relatively painless, taking only a few minutes to complete.